The McGee Australian birdlist now stands at 715. It calls for a drink. Buying take away alcohol poses a few problems for the traveller in the Northern two thirds of Australia. This is because some of the residents of this region have a major alcohol problem. If you are interested in the topic <THIS ARTICLE> is a good starting point. Just to complicate matters three different states have different rules and there are numerous local variations. So in Alice Springs, NT, you will not be able to buy take away alcohol before 2 pm, and you will have to ask for methylated spirits in the camping store, it ain’t on the shelves. In Mount Isa, Qld, your take out must go in your car, pedestrians may not buy alcohol to go. In Halls Creek, WA, the strongest you can buy is light beer. 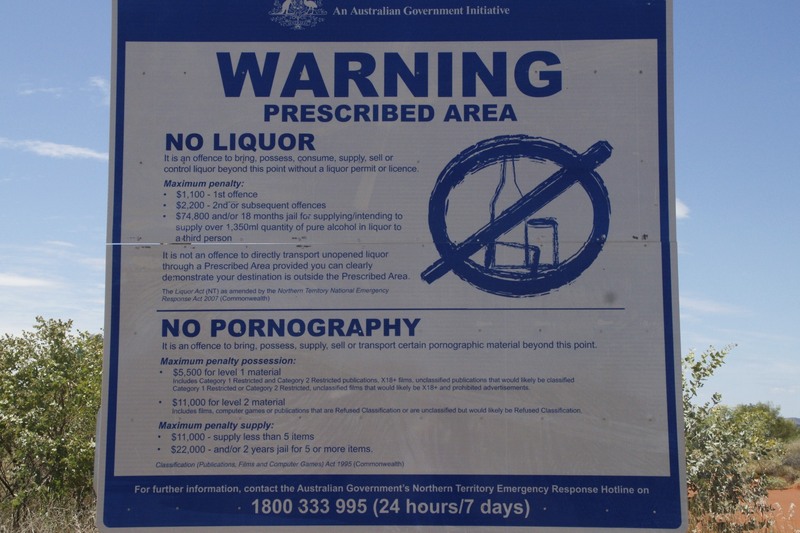 You cannot buy take away alcohol along the Gibb river Road full stop. Having stocked up on just enough to see you through your journey you may reach the boundary of an area where alcohol is banned completely. Penalties for breaching the rules vary from state to state but are severe, fines of $30,000+, seizure of vehicle or boat and prison are all on the cards.